I have always felt like those kinds of parables are a little bit misleading, simply because it sort of paints a black and white image of the world. I am not even certain that good and evil are not wholly valuable concepts because they are subjective and what is good and evil are not always clear. I prefer the more think that things lie on a spectrum between extremes. Those extremes in themselves are perhaps not even well defined. For instead a common example in regards to lying is that it is not always bad. There can be lies that actually are beneficial, at least in the moment. Perhaps they are not big lies, but sometimes it is more important to spare someone’s feelings than be honest if they are not in a position to accept that truth. I think it can be helpful to feel angry at times, provided you direct that anger positively. There maybe moments when being bold instead of humble is the right course of action. Even if humility is an ultimately more important quality. 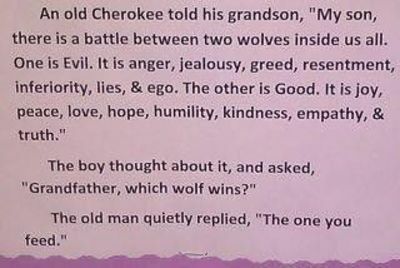 Maybe in the context of this parable it’s important to note that we need both those wolves. Maybe one should always be kept weaker, but I think if you let that “evil wolf” die you might also be taking away something important. Something that you might need at an important moment. I guess I’ve always been one to think that maybe we have to know the darkness to really know and appreciate the light. A very good point. We do need both wolves to be complete. We just don’t need that negative wolf to be our primary focus and influence on our perspectives. As mentioned in the post, I have a grumpy teen in the house. He is right now so much a cup half empty person. “I don’t like school.” “I dont want to do _____.” Grump grump grump. I tell him it takes twice as much effort to be a grump than to have a positive outlook. I tell him there is no need to take everything so seriously. I tell him to chill. I tell him that we are here for him, and I was a kid going through a lot of this stuff too. I have not forgotten what it is like and I have his back. He just right now prefers lemons and sour apples to any of the other possibilities. I am pretty sure it is just a teen phase thing, that he will grow out of, but in the here and now, it does get tedious. …hope all is well with you and yours. And certainly I agree that it is never good to let the darker wolf dominate, but I do think it is just a teen thing. I mean I remember at 13 or so really becoming aware of my dads alcoholism and what it really meant, and how dangerous it was, and why he wasn’t there for me at times. I think a lot of kids once they get to around that age they really start to become aware of how much bad is in the world as well. Dropping your ice cream cone on the ground isn’t much of a reason to cry anymore, and the things worth crying about are pretty dark. It definitely takes some getting used to. I got through a lot of it with some good music with darker lyrics like Pink Floyd. I found it comforting just knowing that there were other people experiencing similar emotions or perhaps even worse and that sort of made me feel better about my situation! lol Of course my parents were “concerned” about the music I listened to, but I never acted moody and depressed so they didn’t worry too badly (I don’t think! ).